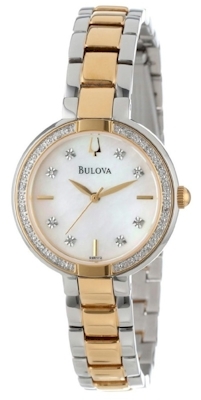 Description: As stylish as it is powerfully accurate, this Bulova two-tone stainless steel women's watch offers a stunningly sophisticated design that's complemented by 26 white diamond accents embedded around the bezel and in dial. It's further accented by a sublimely mother-of-pearl dial face, which includes shiny diamond dial markers, gold hands (with seconds hand). It's completed by a classic two-tone stainless steel bracelet. This precise quartz timepiece also features a scratch-resistant mineral crystal, screw-down caseback, and water resistance to 30 meters (99 feet). This smart looking watch is sure to impress, as it is to complement the perfect sharp outfit. Description: Crystal multi function design in black ion with stainless steel with 120 individually hand-set genuine Swarovski®crystals on case, bezel and bracelet, black dial, day, date and 24-hour subdials, second hand, luminous hands, black ion-plated bracelet, deployment buckle,and water resistance to 30 meters. 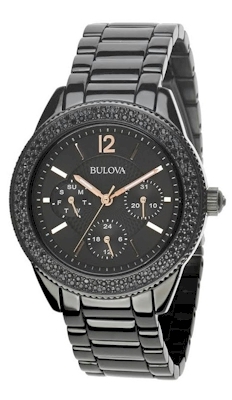 Ladies' watch from the Bulova Crystal collection features crystals surrounding a black dial and stainless steel construction. This Bulova Women's Stainless Steel is brand new, never worn, with original factory parts and 100% authentic guaranteed. Description: This sophisticated Bulova watch for the sleek-minded delivers a smart and urbane look to your everyday style. Sporting a classic-style black stainless steel case and black stainless steel band, this very eye-catching and modern watch is the perfect accessory option for every day wear. 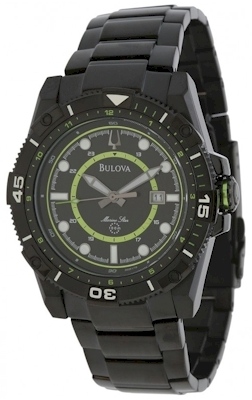 The black dial and neon green accents distinguish this men's chronograph watch from the Marine Star collection. The watch, which includes a unidirectional rotating bezel and quartz chronograph movement, is protected by a mineral crystal. Secured with a push-button deployment clasp, the watch is water-resistant to 100 meters. Change up your timepiece style with this cool gray Marine Star design from Bulova.